Another couple of years of the Argo RG series LPs, much of them taken up with the beginnings of the marathon effort to release all of Shakespeare’s plays on disc – and a fair amount of other ‘spoken word’ albums. 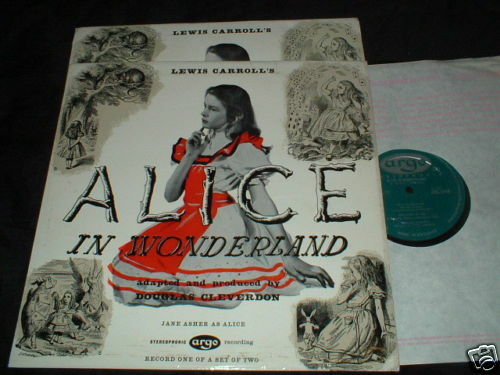 December 1958 sees the first stereo album issued by Argo – Lewis Carroll’s Alice in Wonderland, starring a young Jane Asher. Stereo albums in the list below issued with ZRG prefix and the digit 5 ahead of the RG series number – so, the mono RG 145 becomes ZRG 5145 in the stereo version. Spoken word albums in yellow, classical in grey, folk green, others red. RG 108 Zimbler Sinfonietta; solo violin George Zazovsky Vivaldi – Four Seasons 1958? RG 114 Renaissance Singers, Cond. RG 144 Marlowe Society, University of Cambridge, Director George Rylands Shakespeare Sonnets 1959? RG 183 Jean Vilar French Poetry Anthology 1960? RG 184 W. H. Auden Reading from his Poems 1960? RG 185 Barrault/Renaud French Drama Anthology 1960? RG 196 Louis MacNeice Poems 1961? RG 199 Moira Lister People in Love 1960? ~ by folkcatalogue on March 9, 2010. Many of the Argo Marlow Society Shakespeare recordings are available for download at emusic.com. Paul Scofield plays Hotspur on Henry IV part 1 and he is awesome. A very young Ian McKellen also was a cast member. These are unauthorized grey market bootlegs sold at exorbitant prices by some reprobate. Some of the transfers are dreadful. You can find almost all of them on buried on youtube for free. I am curious about your reference (6 years ago!) to Argo Marlowe Society recordings being available for download from emusic. I have checked and can’t find anything. I’m urgently seeking one particular recording – of As You Like It RG 125-127. Do you have any other information? Hi, I have an argo rg 108 Vivaldi four seasons by Zazofsky but I can’t find it mention on the internet anywhere but here. Do you have any/ or more information on this record?